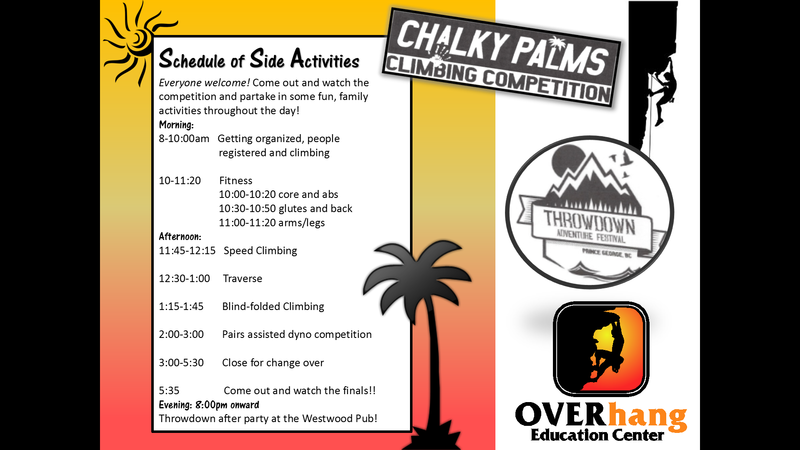 Time for CHALKY PALMS Bouldering Competition a fun family event! Come join us, Sunday November 29, at OVERhang. There will be climbing, slack lining, live music, prizes, and more. Brought to you by the Throwdown Adventure Festival Society (who recently ran the wildly successful ""Hot Day at Otway" bike race), and who are building up to a large, multi-sport adventure festival in a couple years that will highlight climbing, biking, and kayaking, as well a local foods, amazing music, and awesome shenanigans. Competitors can register in either recreational or advanced categories and will have several hours to give it their all, and will be entered for some fabulous draw prizes.